When planning a meal, I often find that sides are the most difficult. Maybe it is because most cookbooks tend to pay only lip service to the sides. Who knows. But this week’s French Fridays with Dorie recipe… well, actually, this week’s recipe will have to wait until next week because, between being out of town on the weekend and my crazed work schedule, this week demanded something simple. 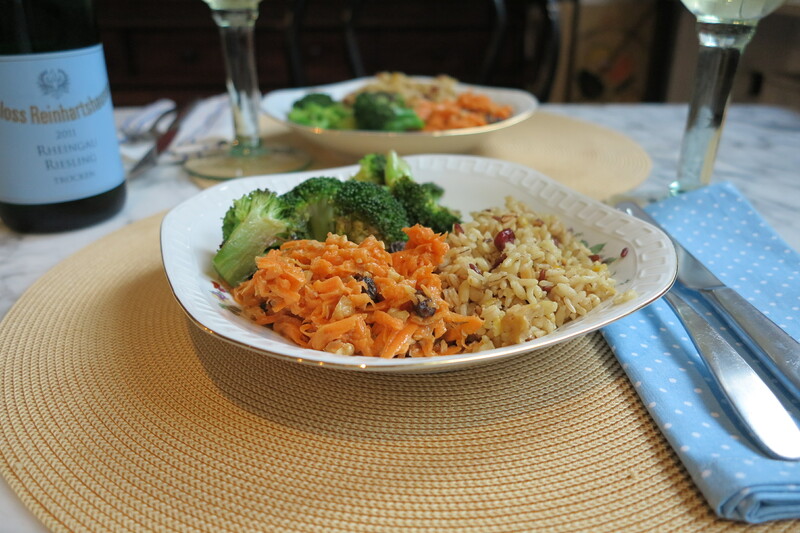 But next week’s recipe, Cafe-Style Grated Carrot Salad, answers the call for a little something different on the side. First let me say that this is not the first time I have made this salad. In fact, it may very well have been the first non-baked Dorie recipe I ever made, after stumbling across it on her blog years ago. Second, let me say to all of my fellow cooks who are planning to make this salad next week, keep an eye on the dressing! I have often wondered if there was a typo in this recipe because half a cup of oil seems to be quite heavy handed for 4 servings and I find that there is a bit too much dressing here for the amount of carrots. However, if you simply dress the salad with whatever amount looks right to you (the leftover dressing is very good on salads or veggies so I usually just make up the full batch) then this is a very quick and easy side to add to your repertoire. It’s probably not the recipe which you will pull out when you are cooking to impress, but it is absolutely one which I pull out on a regular basis to feed the ones I love with tasty and nutritious fare. This entry was posted in french fridays with dorie and tagged Around my French Table, salad, side dish, vegetarian. Bookmark the permalink. Sometimes, simple is what saves the day. I made this one a long time ago, and had mixed feelings about it. I didn’t think it was exceptionally delicious, but I couldn’t stop eating it. I think the textures kept me coming back. And yes–the amount of dressing is ludicrous. I don’t know how I feel about the raisins or carrot salad for that matter. I may have to take a pass next week. Great post! It’s Sunday night in the States and I am just now reading your Post —— after having a hamburger with grated carrot salad for dinner. All ready for next week’s Post. I, too, had made this salad before so I knew the score on the salad dressing. Like you, I mixed up the entire batch and will use it on other things this week. I’ve always liked this because it reminds me of every cheap but good little bistro in Paris or anywhere in France, for that matter. They all seem to have it on the menu and serve it. This time, unlike before, I threw in raisins, walnuts and parsley. Just an easy salad for a family dinner, isn’t it? Rose, I had to skip this FFwD post too. 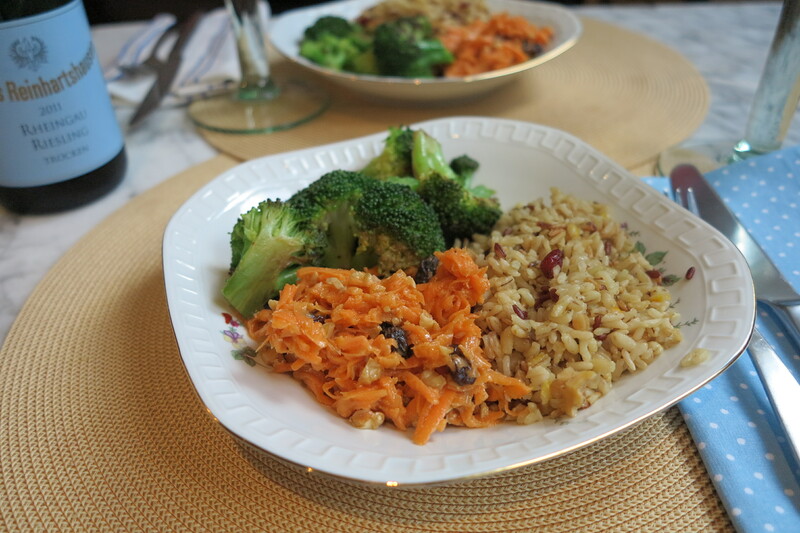 Your carrot salad looks nice on the lovingly prepared plates and so healthy. We actaully love carrot salad like crazy, we eat it at least once a week but never, ever with raisins but with tons of chives and Italian parsley. Nice post! I hope all is well with you! 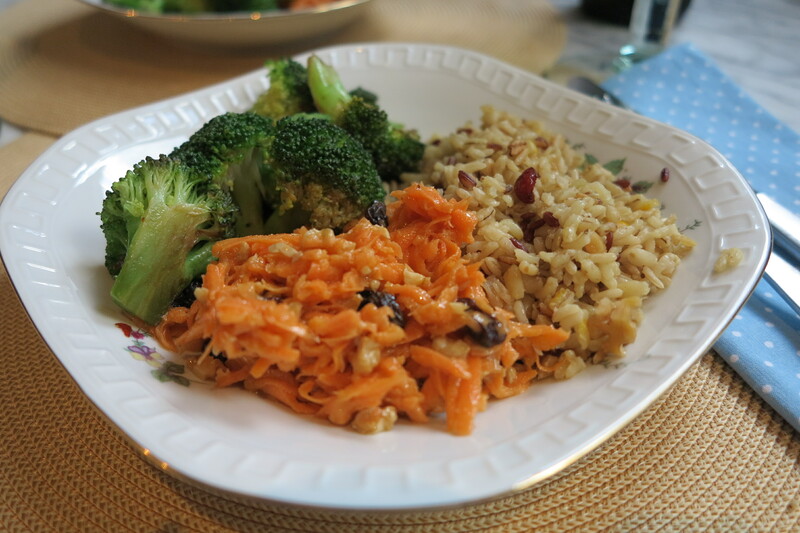 Rose, I have been making a carrot salad for years…it happens to be one of our favorites. My salad calls for a mayo based dressing. Looking forward to trying Dories recipe…looks delicious!! Thanks for the preview! I always like these salads when others make them, but have never thought to make it myself – looks delicious! your presentation of the recipe. Great job. I loved this salad – just made it tonight. Yours looks glorious, and isn’t it wonderful to make a simple recipe every now and again. Love the colours on your plate! Looks delicious! I’m glad you mentioned the amount of dressing, I was wondering the same thing. I doubled the amount of carrots and still thought there was too much dressing. I’m with you, though, I really enjoyed this salad.